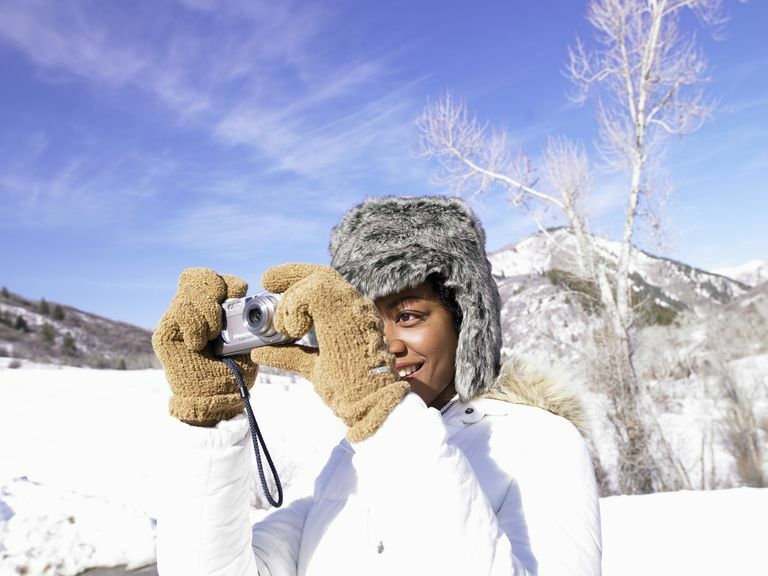 Unless you have purchased a digital camera that’s designed specifically for use in extreme cold, such types of poor weather can be hard on your camera. Some cold-weather environments can cause temporary problems with the camera, while others lead to permanent damage. Exposure to extremely low temperatures will drain the battery more quickly. It’s impossible to measure just how much more quickly the battery will drain, but it could run out of power anywhere from two to five times as fast. To decrease the effect of the cold on your battery, remove it from the camera and keep in a pocket close to your body. Only place the battery in the camera when you’re ready to shoot. It’s also a good idea to have an extra battery or two ready to go. Although the entire camera may work more slowly and intermittently in extreme cold, one of the biggest problems the camera may suffer is condensation. If there is any moisture inside the camera, it could freeze and cause damage, or it could fog over the lens, leaving the camera unusable. Warming the camera should resolve the problem temporarily. You can try removing any moisture from the camera by sealing it in a plastic bag with a silica gel packet. If you’re using a DSLR camera, it’s possible that the internal mirror could jam because of the cold, leaving the shutter unable to work. There really isn’t any quick fix for this problem, other than raising the temperature of the DSLR camera. You’ll find that the LCD doesn’t refresh as quickly as it should in cold weather, which can make it very difficult to use a point-and-shoot camera that has no viewfinder. A very long exposure to extremely cold temperatures could permanently damage the LCD. Slowly raise the temperature of the LCD to fix the problem. If you have a DSLR camera in extreme cold, you may find that the interchangeable lens doesn’t respond as well or quickly as it should. The autofocus mechanism, for example, may run loudly and slowly. It’s also possible that manually focusing with the focus ring could be more difficult because the ring is “stiff” and difficult to rotate in the cold. Try keeping the lens insulated or near your body until you need it. When you warm up your camera after it’s been exposed to extremely cold weather outdoors, it’s best to warm it slowly. You perhaps could place the camera in a garage for several minutes before bringing into the home, for example. Additionally, use the silica gel packet and a sealed plastic bag to draw out any moisture. It’s a good idea to use the plastic bag and silica gel packet both when going from high temperatures to low temperatures, and vice versa. Anytime you subject the camera or components to a sudden, wide temperature change, it’s possible condensation could form inside the camera. Finally, make sure you keep the camera and all related components dry. If you're going to be working or playing in the snow, you'll want to make sure your camera is in a waterproof camera bag or a sealed plastic bag to keep any snow away from it. You might not even realize you had snow in your camera bag or on your camera's components until you return home, and, by then, the snow may have melted, possibly causing water damage to your camera. Make sure everything stays dry and protected from snow, slush, and wet conditions.